Fifteen adventurous and courageous artists are preparing to exhibit far away from the safe white walls of the gallery. 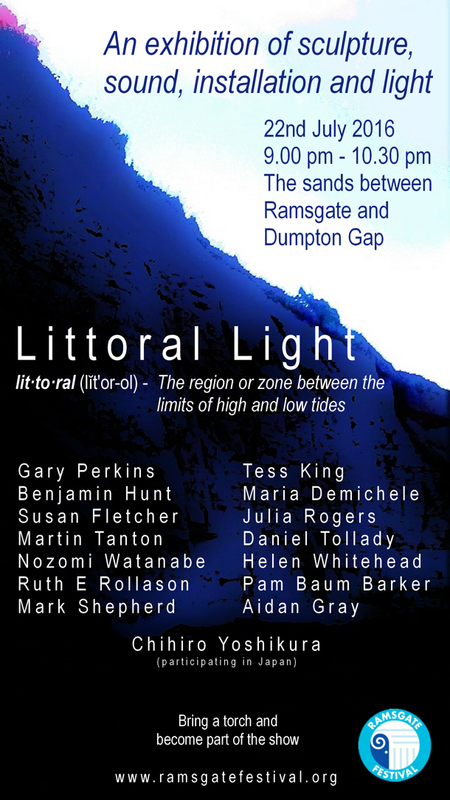 Instead they are choosing a wild seashore near Ramsgate as the backdrop for a unique and exciting exhibition of sculpture, installation, sound and light. To make it even more challenging, they only have a limited time to install, curate and show before the sea comes crashing back into the iconic white chalk cliffs of the Kent coastline. ‘The elements are not conducive with the organising of the event. The artists will be combatting against the tide, the wind, the lack of accessible beach by transport and of course no plug sockets.’ says Susan Fletcher, one of the organising artists. The show has been timed so that the low tide coincides with the sun setting at 9.00 pm and as the natural light fades to total darkness, the works will illuminate the coastline, altering the perception of the landscape and reflecting the sounds of the environment. Visitors to the exhibition are invited to become part of the show by bringing along their own torches and lanterns to light their way as they discover the works amongst the rocks, sand, caves and cliffs. The exhibition opens on the 22nd July and runs from 9.00 pm to 10.30 pm. Entrance to the exhibition area is via Marina Esplanade (Ramsgate end) or Dumpton Gap. From there… just follow the light. Visitors are advised to take their own torches to help light their way and also to become part of the show.